Join the exciting and fun world of CampPete. Learn basic football skills, sportsmanship, teamwork, leadership, healthy habits, plus play great games! Tons of New Games NOW on CampPete! Create Your Own Football Player! Play Football! 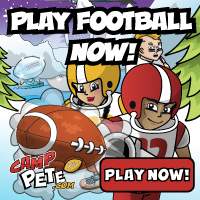 Learn football skillz from Coach Pete Carroll at CampPete! Chat with Teammates and COMPETE to win! Explore a Football World filled with Games. Create Your own Player, Collect your Awards in your Locker! Free to Join, Fun to Play. Camp Pete Sign Up Today!